Have you ever heard the joke about how you can really freak out your boss at work if you start ending all your sentences with the words “according to the prophecy”? 🙂 It’s a funny thought, and it tickles me because SO many things are happening in the Body of Christ right now that truly are “according to the prophecy.” The emergence of the sons of thunder and daughters of thunder is one of them. What are the sons and daughters of thunder? Around 1990, a prophetic word was released by James Ryle that “sons of thunder” (collectively referring to both sons and daughters of thunder) would rise up and bring massive revival. The sons of thunder are prophetic singers and musicians who will begin releasing their music with the purposeful intention of releasing God’s glory in the place they are singing/playing. When the sons of thunder release their sound on purpose, the anointing that they carry sits down on the people where they are, releasing glory and impartation. When these people sing and play, people get saved; spontaneous healings break out; and miracles happen–simply under the prophetic sound that they release. The songs of the sons of thunder literally change the atmosphere where they are. Because they know what they’re doing and are anointed to do it, their songs lift oppression, deposit anointing, and release glory into the hearts of the hearers AND into the geographic place where they are. Well, today, I want to introduce you to a son and daughter of thunder: Daniel and Abby McKee. Daniel and Abby are friends of mine who are amazing, anointed songwriters and worship leaders. Daniel and Abby just released their first EP together, called Higher. They DWELL in the secret place of the Most High (Psalm 91:1), and the songs they write come out of that intimacy with God. AND, they know what they’re doing; they’re purposefully releasing glory with their music. They know how to set the atmosphere, and they know how to release their testimony in song–so that’s what their songs do. 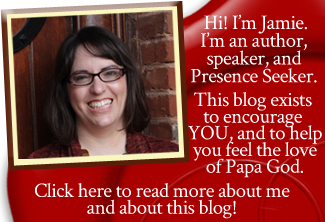 Presence seekers, I am telling you about Higher because YOU NEED THESE SONGS. They will release something into your life. What will they release? These songs are songs of intimate, sold-out, desperate, pour-out-perfume-on-Jesus worship. They will bring you right into the throne room so you can be captivated by the nearness and beauty of Christ. So. Don’t wait. Would you please go get Higher today? And then sit down and worship Jesus awhile, because He deserves for you to pour out your love on His feet. And Daniel and Abby’s music will help you do just that. That’s it, folks! 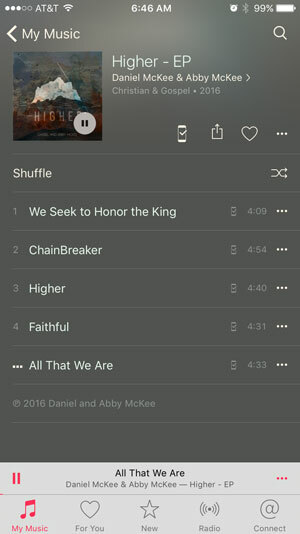 Go get Daniel and Abby’s EP, Higher, TODAY! You’ll be glad you did! This means SO MUCH to me Jamie. Please pray for me. Are you feeling the call, sis? But the hour cometh, and now is when the true worshippers shall worship the Father in Spirit and in Truth; for the Father seeketh such to worship Him. God is a Spirit, and they that worship Him, must worship Him in Spirit and in Truth. Then what am i to do? I will pray with the spirit, by the Holy Spirit that is within me, but i will also pray intelligently, with my mind and understanding; i will sing with my spirit, by the Holy Spirit that is within me, but i will sing intelligently, with my mind and understanding also. And He hath put a shir chadash in my mouth, even tehillah unto Eloheinu; many shall see it, and fear, and shall trust in Hashem. So heavy in a full to bursting way. Thank you Jamie, for your caring and prayers.